I’m looking to meet more divers in Minnesota. I am in the Ottertail County area and would love to go diving with a group. 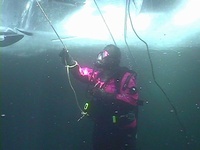 Divers are few and far between in my area.. Maybe I can come to your area? Let me know! More to the point.. I’m in Fergus Falls Minnesota. I feel your pain. I’m in Grand Forks. Going to be in Bemiji for a long weekend next week. We’ll spend at least one day at Cass lake. Great lake to dive in and a ton of crawdads for a boil. Water is very clear and warm. At least it was this time last year. I was diving at 35-40 feet with no wet suit. Some steep sandy drop offs. without a wet suit? Nice! here in Otter-tail county, The thermocline starts around approx 19ft. Practically freeze to death in them even with a full wet suit! ha! Now I really have to check out Cass Lake. Have you added it to the dive sites section here? It would be awesome to see pics and such. No, not yet but I will after this trip. Didn’t get pictures last year. I posted a dive site for Cass Lake. My wife may have some pics to add to it.